The fact that PASOK and ND jointly received 32 percent of the vote share in the May election, a particularly low percentage that they hardly ever received even on their own in the past, is enough proof of the – possibly permanent – decay of the traditional two-party system of the past four decades. 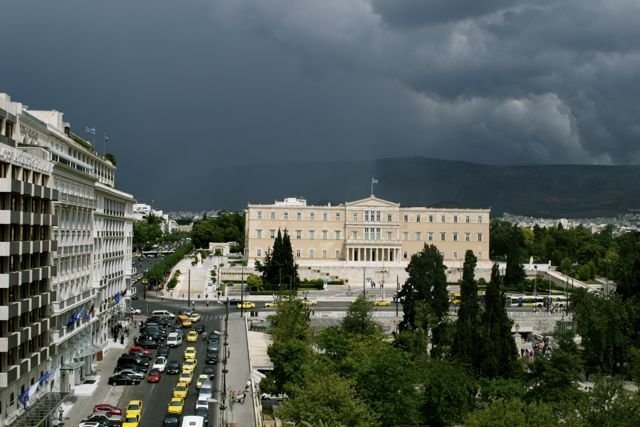 In fact, PASOK’s decline in recent polls has made some ponder whether it will make it into parliament in the next elections. Greece’s two-party system appears to have been replaced by a fragmented political system. 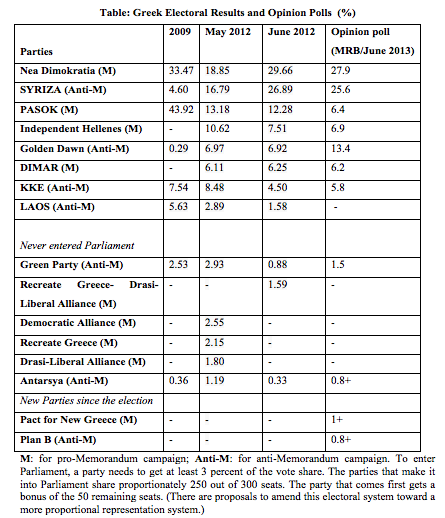 From PASOK-ND we have moved to a ND-SYRIZA competition. Important differences exist between the two different eras. The ideological distance between the two parties is larger today than in the recent past. In the traditional two-party system the parties competed for one party governments while today this seems highly unlikely. We are facing a fragmented political system where any winner will have to form a coalition government. The Greek political system, a system of one party governments for decades, today already has its second three party coalition government in a period that amounts to a little over a year. In both coalition governments, we have PASOK and ND as main partners. The first coalition government had the popular right LAOS (Popular Orthodox Rally) as the third partner, and the current euro-friendly government has left wing DIMAR (Democratic Left) support, respectively. This coalition pattern is yet another piece of evidence supporting the centrality of the memorandum/anti-memorandum cleavage in the current juncture. In place of a system of governmental stability and relatively stable political personnel in the past year, we had two elections and new faces entering the political scene. Following the 2009 election, we had two more elections in 2012, while it is not unlikely to have another in the not so distant future. More alarming is the fact that in less than a year, Greece had 4 different PMs: Papandreou (PASOK’s former President), Papademos (led the first coalition government in 2011), Pikramenos (interim PM that led Greece to the June 2012 election), and the current PM Antonis Samaras (President of ND). Another sign of volatility is depicted through the constant changes in the Ministry of Finance, which has changed hands five times in three years. The memorandum/anti-memorandum cleavage has given a boost to former “small parties”. Today’s main opposition party, SYRIZA, skyrocketed from 4.6 percent in the 2009 election to 26.9 percent one month later, while its vote share has fluctuated between 25 to 28 percent in recent polls. More spectacular has been Golden Dawn’s electoral fortune – this party is considered to be one of the most extreme right wing parties in Europe. Golden Dawn sky rocketed from 0.3 percent in 2009 to a stunning 7 percent in 2012, increasing its vote share by 2400 percent, and it is currently running third in the polls. In the most recent poll Golden Dawn is projected at 13.4 percent, making it the party with most gains since the June election. Despite the boost that the left overall has received from the financial crisis, the Communist Party of Greece (KKE) did not end up benefiting proportionately. Maybe the party’s consistent but traditional ideological stance has not been attuned to the extraordinary times. Thus, KKE experienced a rise from 7.5 percent in 2009 to 8.5 percent in May 2012, but a decline to 4.5 percent in the June election – a result of the polarization between ND and SYRIZA, which was now successfully posing as a potentially governing left wing party. KKE is currently polling at 5.8 percent, an important increase of its projected vote share that coincides with a change in its leadership after 22 years! What all these parties have in common is their absolute rejection of the terms of Greece’s bailout – other than that their political platforms could not be farther apart. New parties were created and others are currently being incubated across the whole political spectrum. On the left, DIMAR (6.2 percent in the elections, polling at similar levels, and one of the three parties supporting the coalition government) was the result of the split within Synaspismos – a predecessor to SYRIZA – during 2010. In the liberal camp, we saw three newly established political parties running in the May 2012 elections (Democratic Alliance, Recreate Greece, and Drasi) and receiving collectively approximately 8.5 percent of the vote share. But due to the 3 percent threshold in the Greek electoral law, none of these liberal parties entered Parliament. A month later in the June election, Democratic Alliance was integrated into ND, while the other two liberal parties joined forces in the election. These two parties do not appear to be maintaining their vote share in recent polls. A new party has emerged in the center left from PASOK’s ashes. Former Minister of Health with PASOK, Andreas Loverdos, founded Pact for New Greece, which is squarely positioned in a pro-Europe and pro-Memorandum camp but with a critical stance. Another more recent splinter party on the left is that created by the former head of Synaspismos, Alekos Alavanos, called Plan B, which openly advocates the return to the Greek drachma and opposes the austerity measures. On the right, Independent Hellenes, a splinter party from ND comprised MPs that opposed the memoranda, received 10.6 percent in the May and 7.5 percent in the June elections – the latter being closer to the percentage at which they are currently polling. Recently, however, there has been internal turmoil in this party. Overall, rumors for new parties are omnipresent, including even one by former PM George Papandreou, but it is hard to tell if these are hot air or not – a not uncommon feature in a country where conspiracy theories abound. Given the extraordinary circumstances, expectedly volatility characterizes not just the electorate, but also the MPs themselves. In recent years, resignations and removals of MPs from parliamentary groups became very common – especially during important votes. In this context, we can no longer safely predict the outcome before the actual vote. As one example, in the last Parliament there was an MP that changed three parliamentary groups (he moved from ND, to LAOS, to Democratic Alliance). One more sign of the crystallization of the memorandum/anti-memorandum cleavage is that the moves across parties follow this cleavage and—in some cases—are even produced by it. An important unknown is the impact that scandals involving prominent political figures can have on the developments in the political arena. For instance, a former Defense Minister and the Mayor of the second largest city in Greece are in prison while the former Minister of Finance, Giorgos Papakonstantinou, is currently being investigated for tampering with a list of possible tax evaders. An exacerbating factor, however, is that these developments are occurring in a society full of rage toward anything that reminds of the old political establishment and with no clear signs of relief. The legitimacy of the Greek political system has been undermined. Without wanting to exaggerate things, it is a fact that verbal and even physical attacks against political figures have occurred with uncomfortable frequency. Let us just say that this is not a good period to declare that you are a politician. Significantly, specific parties are accused as tolerating and/or encouraging violence. At the same time, however, we do have some signs that new respected figures are emerging in various realms of social life; but again, this process is filtered through the lens one has over the new main cleavage we discussed above. The radicalization of society is helping the electoral fortune of both the left and the extreme right. Counterintuitive is the electoral rise of the left and the simultaneous rise of approval ratings for privatizations and reversing tenure in the public sector in opinion polls. The electorate is under pressure of uncertainty about the future, rapid aggravation of the economic situation and deterioration in quality of life. Undoubtedly, the current cleavage between the memorandum and anti-memorandum camps is dominant but it will ultimately dissipate; the important question is what will take its place as the new dominant cleavage. Clearly, any new cleavage is likely to involve diverging visions for achieving economic growth, reducing unemployment, Greece’s role in the EU, the role of the state in the economy, holding the old political establishment accountable, and establishing social order. The optimistic scenario is that Greece will be saved and a new political class will emerge from this crisis. This new political class will most likely be representing figures—political, business, social entrepreneurs—that dealt well with the challenges of the crisis. Together with this new political class, a new mentality will capture the collective imaginary of the Greek people and a less corrupt social contract will emerge. The pessimistic scenario involves a prolonged period of uncertainty, decay and social unrest. Thanks for the really resourceful post! I have a quick question. You say that ” The result, however, is a counterintuitive coalition government that would correspond to the Conservative party governing with Labour in the UK or the Democrats with the Republicans in the US. And this in a political system that has traditionally had an extremely polarized electorate. The fact that PASOK and ND are today in a coalition government is a sign of the strength of the memorandum/anti-memorandum cleavage.”, but are these the right comparisons to do? Although it is hard to find a country where the political institutions are similar to Greece, aren’t Germany, The Netherlands, Sweden or others more comparable to the Greek electoral system? In that case, coalitions between large parties are not completely unheard of. Thank you for your kind words and the question you raised. It allows us to clarify this point. The comparisons we draw are not concerning the electoral systems but rather the ideological and historical gap between these parties in the UK and the US. Of course the electoral systems in the UK and the US are very different from each other and from the Greek one. Beyond the ideological differences, PASOK and ND are two parties that have repeatedly exchanged really harsh accusations about each other in the past, whose fanatical supporters used to fight each other in the streets (at least in the 1980s), and so forth. A government coalition with this composition would sound like a story out of a science fiction novel four years ago.